1. 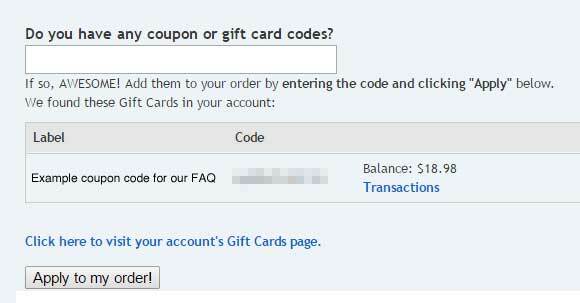 You can now enter coupons and gift cards into the same text field at checkout. Easy! 2. You must enter a gift card code and click the Apply button in the entry form for your gift cards to be attached to the order. This is different from the previous version of the site, which would automatically apply them during the checkout process. 3. This also means that gift cards are no longer a payment option. Now, instead of using a "pay with my gift certificates" button alongside credit card, PayPal, etc., you simply apply the GCs to your order as explained above, and continue the checkout process. When you get to the Review / Payment page, if your order total is covered by your applicable gift cards, you'll see the message "Payment is not required" where your payment method selection form would normally be. Just hit the "Continue" button to finish the checkout process, and your order will be complete! Looking to gift some riffs to a friend? Purchase an e-Gift Card here!